One of the biggest advantages of running an eCommerce business is that your business has wings. All you need to do is learn to fly. You have an unlimited opportunity for growth and exploring new avenues that help you reach out to new customers, form profitable partnerships and ensure your topline revenue doesn’t have to suffer the ups and downs of your existing market. But there is a problem here. You will find a lot of businesses ignoring the “call of the wild”. They stay put in their marketplace, afraid to venture outside and tap into newer and more profitable market segments. This is a cardinal error, because it can lead to stagnation. Once you optimize the potential of your eCommerce business in a particular market, there might be no space left for any more growth. What’s more, there will be new businesses vying for customer attention. Yes, you will compete, and have to compete, but why place your eggs in one basket alone. Why not find another basket or a set of baskets and keep finding them. Why keep worrying whether online shopping is really profitable and whether it will keep delivering returns over the long term. Take steps to minimize your risks. The best idea for you will be to cover your bases and for that you need to become a global player. When the first department store opened its doors for shoppers, it didn’t have to do all that much to attract customers. It was the only store and customers had no other option but to buy from that store. After a period of time, more stores opened and it suddenly found itself competing for customer attention. It had to market its products and services, come up with amazing offers, add to its product offerings and keep taking steps to attract more customers. Something else that it did was open more outlets, to target more customers. Now juxtapose this thinking to eCommerce businesses. The first businesses to foray into eCommerce had the first mover advantage. They didn’t have to try too hard to capture a slice of customer mindshare. If at all, they had to focus their energies on making traditional shoppers comfortable with the idea of buying online. Cut to a few years later and the eCommerce boom. Online shopping is growing like crazy with more and more customers taking the online route to buy products; this had led to an influx of eCommerce stores opening shops and vying for customer attention. Competition is tough and it will get tougher. You might have a great idea for an eCommerce store that targets a particular demographic, but rest assured you’ll have other stores competing with you for attention of the same demographic with similar products after some time. In this case, you might find your potential customers choosing your competitors over you. You will find them abandoning your shopping cart and buying products from your competitors. While you shouldn’t accept defeat in this case, why not make an effort to target the same demographic in a different market, the kind of market that is rife with possibilities and where the competition is not as tough. 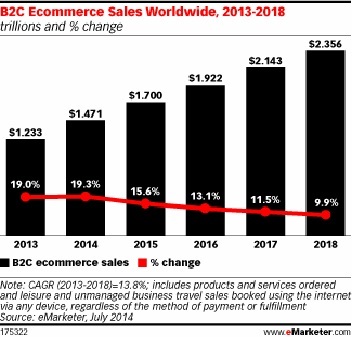 A recent eMarketer study says global eCommerce sales will touch $1.4 trillion in 2014 and reach a figure upwards of $2 trillion by 2018. It also says each region will experience year on year increase in eCommerce sales, and the Asia-Pacific region will be the leader in eCommerce sales. Now, you will look at these figures and say to yourself, ‘Ecommerce is the place to be and I could just target any of these markets and my cash registers will jingle’. Well, it’s not quite that simple. Take the example of Canada, where in late 2013 eCommerce sales growth slowed down. While there was an economic reason for this downturn, another reason was that Canadian online shoppers made their way to online stores in other countries to shop for products. This was bad news for Canadian eCommerce store owners, but good news for their overseas counterparts. For example, many of them were buying from US online stores as opposed to Canadian online stores. 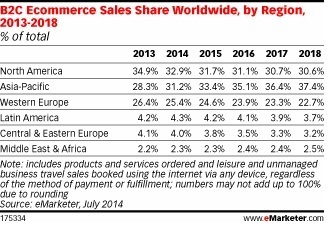 One is different countries (let’s call the markets) will have differing eCommerce growth charts. The growth won’t be consistently on the upswing. You’ll need to prepare yourself for a downturn. The second takeaway is that your store needs to become a global eCommerce store. You can’t depend on just one demographic, restricted to your home country for your sales figures. Canadian shoppers bought from US online stores because these stores made it easy for them to shop for products and in some cases offered deals and discounts that targeted customers from newer markets. The question is – Have you started doing this yet? It’s pretty simple really. In times when you are exploring newer markets for your eCommerce business, you’ve businesses coming in from everywhere. You are not dependent on just one market. Doesn’t this make perfect business sense? There is a school of thought amongst online merchants selling products that the whole idea of exploring newer markets is well and good, but this requires significant investment of resources like time, money and effort. While they are right about the investment part, they are wrong about this investment being prohibitive. How do I manage multiple sales channels? How do I manage increased inflow of customers? How do I offer customer support? How do I align my purchasing and accounting functions with increased sales? These and many other questions can be answered if you pick a commerce suite that takes care of all your needs. If and when you decide to tap into newer markets, start searching for the right platform that will support your endeavor. You’ll find that you will be able to leverage the potential of newer markets without busting the bank. Don’t allow your size or financial limitations come in the way of expanding your ecommerce business.